Lime and vanilla really is a fantastic flavor combination, although it’s not necessarily the first one you might think of when it comes to desserts. Lemon and orange are far more popular when it comes to citrus, but lime deserves a role at least as prominent. In this chiffon cake, lime really plays a starring role and many will be surprised to find that it isn’t overpowering in the least. The cake is sweet with a great citrust tast, and much less tart than other lime desserts, such as key lime pies. I think that the glaze is a nice touch and included simple instructions after the cake recipe, though I should hope that you all will know how to make a simple glaze with powdered sugar after the number of times I’ve mentioned it here! This cake is moist, light and very tender. Even though it is an egg-based cake, it doesn’t taste overly “eggy,” but has that plesant springy texture that sponge cakes have. It goes extremely well with berries, but is equally good on its own if berries aren’t available. You’ll note that the recipe calls for sifted cake flour. Simply sift more flour than you think you’ll need onto a sheet of parchment paper, then spoon it up to fill the measuring cups to the desired amount. Funnel the rest of the flour back into its box/bag for next time. The flour is so light that the amount (i.e. the weight) will be too much if you sift after measuring, so be sure to do it first! One other thing to note is that the egg whites should be at room temperature to whip up to their full volume. Eggs are easier to separate when they are cold, so separate the yolks and whites (disposing of the extra yolk) into two small bowls, cover with plastic wrap and let sit out for about an hour or so before beginning. Preheat the oven to 325F. Get out a 10-inch tube pan, but do not grease it. In a large bowl, whisk together the flour, the sugar (reserving 2 tbsp), baking powder and salt. In a medium bowl, stir together in the lime juice, vegetable oil, lime zest, vanilla and egg yolks, then pour into the dry ingredients and stir until smooth. In another large bowl, beat the egg whites to stiff peaks, adding in the last 2 tablespoonfuls of sugar when the whites begin to get foamy. Gently stir 1/4 of egg whites into the lime mixture to lighten it. Gently, working in two additions if it is easier, fold the remaining beaten whites into the lime mixture until no streaks remain. Pour into the ungreased tube pan and bake for 55-60 minutes, until the top springs back when gently touched. Invert cake over a bottle (or onto a wire rack if your pan has “feet” to hold it up) and let cool completely. When cooled, run a knife around th edges and turn cake out onto a platter. Makes one cake. Serves 12. For another chiffon cake, check out the Banana Chiffon Cake I made a few months ago. oh yummy – this is making me hungry!! Yum! I’m always looking for more things to do with lime — it’s the perfect taste at the end of a meal. This cake looks soooo good!! Here in Brazil, we use limes all the time (in fact, we use limes here the way you guys use lemons there). 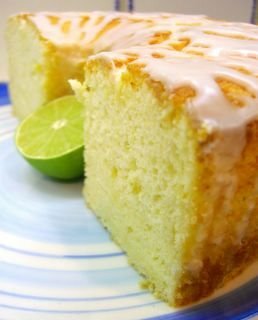 I love lemon/lime cakes and definetely should give this recipe a try. Tks for sharing and the photo is yummy! Do you know what the weight of the cake flour is? I normally like to bake using weight vs cup measures. I’m curious to try this flavor combo. I love lime in savory dishes. Thanks for the tips on whipping eggs and sifting the flour. Sometimes I neglect the sifting step, but I know it helps! Yum! I like when the citrus is baked in rather than drizzled over (though a citrusy icing is always welcome!). Lime sounds delicious and you don’t seem it often enough. I love reading your blog – wonderful pictures and writing. I generally substitute limes for lemons a lot in dessert and found that it works very well…I even made a lemon custard pie…only with limes! I could dive and hide into that cake! Can’t go wrong with chiffon cake and can’t go wrong with citrus! Sounds delicious. Lime is one of my favourite citrus-themed desserts and I do love a good chiffon (although the number of eggs always make me baulk! lol). Well i made this cake yesterday but was disappointed. It was very fluffy but the taste wasn’t very good.The normal sponge cake is much better. I really liked this! I baked half of the recipe, and then split the cake in half horizontally and filled it with a lime mousse filling. It was excellent!